What you see before you is known as Impossible Pie. It's called that because there's no crust involved--it magically forms its own. I think it should be thusly named for another reason--it's simply not possible to eat only one serving at a time. If you like coconut, you'll like this pie. There's no way around that. It's a fact. Set in stone. Done and done. The top is toasted and crunchy, the innards are creamy, and the nifty crust is chewy. It's a cinch to prepare. Did I mention that you don't have to fiddle with a crust? I actually don't mind playing with pastry, but I have to admit that it's nice to skip it every once in awhile. I'm not sure where this recipe originated, but it's one that the great Mambino has made often and fortunately, she's trained me to make it too. It's usually formed into one regular-sized pie, but in this instance, little baby tarts seemed the ideal way to go. You'd think they'd make nice, individualized portions, but as I mentioned, it's IMPOSSIBLE to stop with just one serving. If you can resist, you're a stronger person than I.
Preheat oven to 350°F. Grease a 10-inch pie plate or a muffin tin with cooking spray. In a medium bowl, beat the eggs and add in the cooled, melted butter. Blend in the flour and sugar, then add the milk, coconut, vanilla, and salt and beat until thoroughly mixed. Pour into the prepared dish. 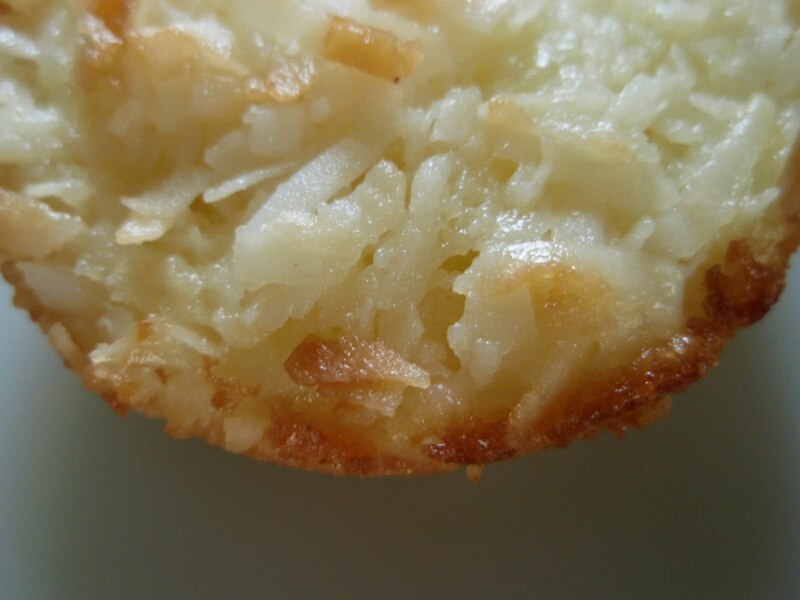 Bake 40 to 50 minutes or until the coconut becomes golden brown and a knife inserted into the center comes out clean. Be sure to cover and refrigerate any remaining pie. Yeah, right. Like there'd be any left. Grace, this pie is amazing. All the wonderful sweetness without the crust ~ How great is that! This would not last very long in my fridge, because I love coconut cream pie. I am not sure if I should give you a hug or keep my fingers off the "print this page".... so I will just thanks. We've been loving the coconut flavors lately, and had a few coconut savory dishes in a row, now it's time for something sweet and this is a perfect recipe - I will make this scrumptious pie asap! Oh my... delish!!! I'm heading into the kitchen to make these now. Thanks for sharing the recipe. PS - love your blog! You're killing me. This doesn't look especially WW-friendly, but I don't think I care! What a great idea for a pie without dealign with crust! Now that sounds delish! Plus there's coconut. Anything with coconut has to be awesome. Never heard of it but I like coconut and even better no crust to mess with? I'm all over this! 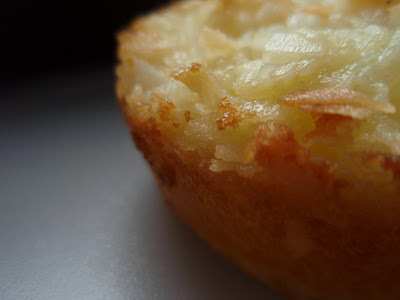 I have heard of Impossible Pie but have never tried it...since I have an undying love of coconut I should get with it! Yum, I'd forgotten completely about this pie. It's been years since I last made it. Thanks for the reminder! Although the mini-serving tip might just be a bit dangerous. It looks so tempting and scrumptious! It's like a giant macaroon pie, yum! I love coconut! I am obsessed with coconut, so I have to try this. It looks so good! BOOKMARKED. I love, love, love coconut - it looks fantastic Grace! I have always loved Impossible Pie. Sadly, my dearly beloved doesn't love coconut. Silly man! I may just make this for my daughters and myself while they're home for Christmas! If only Lon liked coconut...maybe I'll try anyway. If it is from your Mamster I am making it! Grace my dear, you are killing me with all of the coconut! I shall be even chubbier than I already am soon! mmmmmmmmmm! I can say from experience, that this a very yummy, foolproof pie. I think it is one of the first pies I ever made! Thanks for the reminder! This is so cool! The chewy crust looks delicious, and I love the idea of this as mini tarts. I love that you love coconut just as much as I do. I need to get back on my coconut kick soon. And I love this, I mean come on. We used to make "impossible pies" all the time back in the day. Impossible Cheeseburger Pie, Impossible Coconut Pie, Impossible Bacon Pie. Ah, brings back lots of memories. Of course those all had Bisquick in them, your's sounds a bit better! How do you do it day after day? Always a great recipe. I am in awe. Coconut rocks. Have you thought about dump cakes? I have a great pumpkin dump cake recipe. LOL. hmmm...i think i will still try this though it sounds great! the no pie crust thing is great! oh and thanks so much for stopping by my blog and commenting on it! I'm not a big coconut fan, but this still looks good! This looks very good and something I would have not ever thought of! impossible! hahaha! this is interesting. a crust formed on its own. this is a must try! Wow... that looks incredible... sooooo when did you say you wanted to adopt me to help you eat all your treats? Just say the word! grace!! its the PERFECT pie! i'm not a huge fan of crust so to have a pie without the crust...YEAH!!! and it looks divine! My mouth was already watering just looking at the creamy coconut, which I LOVE, but you sold me when you said you don't have to fiddle with a crust! I always make my quiche crustless just to avoid dealing with a crust; but I've never tried a crustless pie. It's now bookmarked in my Delicious cookbook and I can't wait to try it! Grace, you're always performing some magic for us! This looks chewy & crunchy & all around yummy. This will definitely inhabit my kitchen, that is possible for sure! MMMMMMMMMMMMMMMMMMM,...this recipe would make lovely individualised mini cakes! I just love this yummie combination, Grace! This pie looks amazingly good, unfortunately I am not a coconut fan. My mom and sister are, however, and I'm sending links off right now. I know they would love to give this a try! Boy, they sounds good. Really, really good! what a great pie! i love the coconut in there, looks delicious! With some lime zest.....and maybe flaked almonds....heaven! The coconut would have me sold on this. You have some of the neatest recipes...just lovely! Oh my goodness. Must try this one -- and gorgeous picture!! I am a sucker for coconut. Ho boy, doe those ever look and sound GOOD. I agree, it's nice not to have to mess with crust once in a while. I am making this for the hubs this weekend!!! We're both coconut fiends. Thank you! Grace, you're killing me. This looks so good that I'm wondering if I can find some local coconut (just kidding). This is now on my list to try. Thanks! Unfortunately I'm weird and don't really like coconut...but this pie is definitely an interesting idea, and I too like to say peace out to the pastry crust once in a while. That sounds really good. One question- is it sweetened coconut or regular? Come visit us and check out our new look! Thanks for following us! Not a great fan of coconut but the pictures are killing me! I bookmarked this when you blogged it, and I'm making it already. It's in the oven, and I licked the bowl clean, raw eggs and all. YUM. i can't wait to see how it turns out! Easy enough!! Looks delicious! I am a food's teacher and use blogs as a teaching tool. Yours is nice! This may have to be on my Christmas table! I LOVE coconut. Oh this does sound so very delicious and creamy. I made a few of those individual pies yesterday and really wished I made more - they disappeared before they even had a chance to cool down :) My daughter and I really loved them! I'll be making them again soon so my hubby could try too! I LOVE the idea of a crustless pie. It sounds delicious! Thanks, Mambino. I had all but forgotten about the Impossibles. I once had recipes for several different kinds of Impossible Pie. I'm not a coconut fan but this does sound like fun. I might make it anyway! Ha! Self-crusting pie - now I've seen it all :) Looks gooeylicious Grace. Sounds like a great pie. I've not seen this before, but I love coconut so this recipe is right up my culinary alley! I like the little tart idea. So sweet and dainty that way. But I would probably eat 3. I've always wondered what an impossible pie was! But this looks so good! I was so happy to find this recipe as I've been looking for a similar one for quite a while. I've just baked it, with a few changes, and published it (and a picture of the creamy inside!) on my blog. Using unrefined cane sugar gives the creamy centre a real caramel edge. thanks! Turned out really lovely. Made this for a community picnic and it disappeared in no time! When making these in a muffin tin, how long do you bake them and approximately how many "muffins" does this recipe make. Thanks for your info. @Deborah: I used a silicon muffin pan and got 12 decently sized pielets, and it only took about 35 minutes to get them good and browned. Just pull them out when the coconut is nicely toasted--the filling should be perfect then!